As I may have mentioned before, I generally receive a several cookbooks for major gift-giving occasions. This isn’t surprising; after all, I have a known cookbook problem, and I have several cookbooks on my Amazon wishlist. I’m fairly familiar with the major cookbooks that are released, what the buzz is, and what the classics are. But this Christmas my aunt (who is a fantastic cook) gave me a book I had never heard of — the Auberge of the Flowering Hearth, by Roy Andries De Groot. “It’s the book that inspired Alice Waters,” she told me. I thanked her politely and added the book to my already crowded shelf of food and cookbooks. A month or so later, I had finished my book club book for that month and was looking for something to read, and my eye fell on the Auberge. The book is unassuming, with its seventies cover and relatively unknown author (who was at some point the President of the Gourmet Club, which I’m sure had some real meaning in 1973, but sounds made up to me, like something an enterprising high school student would use to pad their college application), but I thought it would be an excellent soothing bedtime read. What I found was part travelogue, part food memoir and part cookbook. The author begins with a trip he takes to the Valley of the Grande Chartreuse in the French Alps near Grenoble, where the liqueur Chartreuse is made. In a quest to find the source of the famous liqueur, he happened upon an inn, run by a pair of middle aged women who cooked extraordinary cuisine. The author, who, as President of the Gourmet club, was quite interested in food, asked to learn more about the food at the inn, and thus the concept for the Auberge of the Flowering Hearth was born. Reading the cookbook is not particularly soothing at bedtime. Yes, the descriptions of the French Alps (one of the most beautiful regions I’ve ever visited) are detailed and transporting, but the descriptions of the food just make you HUNGRY. The ladies of the Auberge (both of whom were natives of Provence, rather than the Haute Savoie) used the local delicacies of the French countryside to craft cuisine that was intrinsically tied to the local, seasonal cycle. In the spring they serve strawberries, in the autumn, game. De Groot provides the menu for, and describes in astonishing detail several meals he took at the Inn over the course of a year, with everything from amuse bouches to cheeses to wines. The menus are from a different age, when game regulations were far less strict, but they still have a surprisingly modern feel to them; and many of the dishes described wouldn’t be out of place in a restaurant in San Francisco. Which leads us to Alice Waters — “local and seasonal” has become a catchphrase now – if one more Top Chef contestant describes that as their cooking style I think Padma’s eyes might actually roll back into her head. But it has become a catchphrase because of Alice Waters and what she did with Chez Panisse. And Alice waters was inspired to start the movement in America because of the local and seasonal food that Mademoiselle Vivette and Mademoiselle Ray were cooking in a small inn deep in the French countryside. And the best part of the book? Most cookbooks leave me wanting more description of the dishes I am about to invest time in cooking. Most food memoirs leave me with an ache to taste the dishes that are described with such mouthwatering detail. This book is a cookbook and a food memoir, and provides recipes and lessons in technique in addition to the evocative descriptions. It is a cookbook you can read, or a reading book you can cook from. Some of the recipes are utterly impractical for the home cook, such as the pheasant terrine that serves eighty people, but others, like this endive and bacon salad, or the Chartreuse souffle, are not only feasible, but surprisingly delicious. I’ve had endive salad before, and salads made with warm bacon dressing, but something about this particular combination and proportion, with the tarragon adding a grassy tang to the acid of the vinegar, the bitterness of the endive, and the smoke of the bacon, was particularly compelling. I grudgingly shared it with my husband, but I would gladly have eaten the whole bowl myself. In short, this is an extraordinary book, and one I would recommend without reservation. Combine the vinegar and tarragon. Heat gently (I microwaved for 10 seconds) and let cool. Slice the garlic into the olive oil in a large skillet over high heat. Toss in the bread cubes and cook, stirring frequently, and trying to brown all sides of the bread cubes, until the cubes are golden and crisp (but still chewy in the middle. Set aside. Fry the bacon in a large heavy skillet until brown and crisp. Once the bacon is crisp, remove from the skillet and crumble. Do not discard bacon grease. 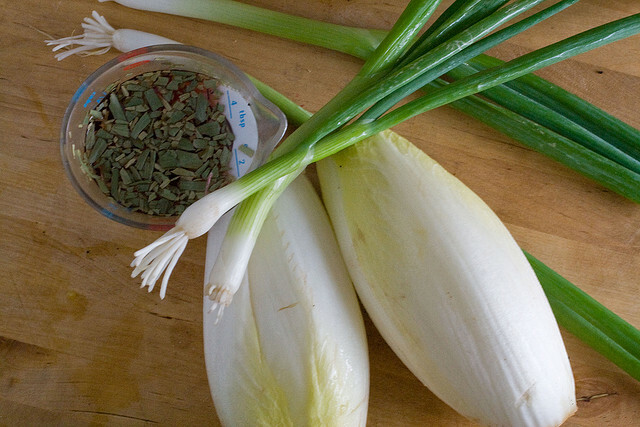 Chop the endives into ½ inch pieces, leaves separated, and chop the scallions finely. 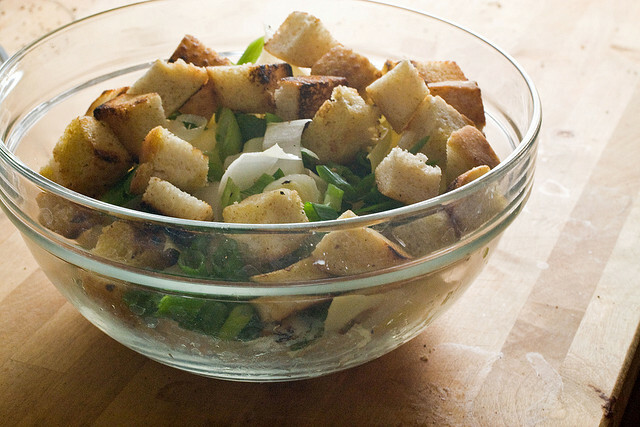 Combine in a large bowl with the croutons and the crumbled bacon. Add the tarragon infused vinegar. 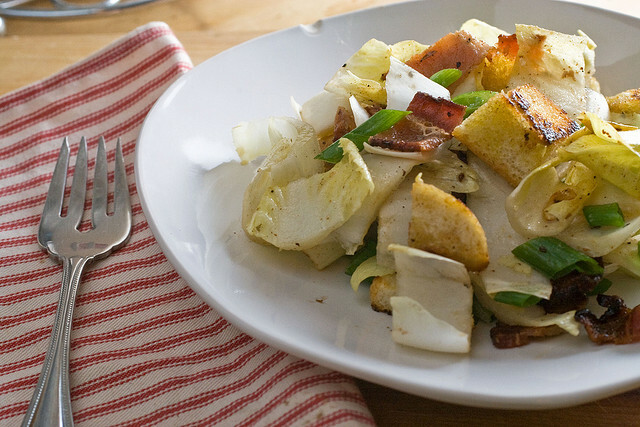 Pour the hot bacon grease over the salad and toss until all ingredients are combined. Serve, as part of a wonderful lunch at a rustic inn the French Alps, or a weeknight dinner in urban Los Angeles. My current favorite cookbook (because I live in South Texas and like to cook local and seasonal 🙂 ) is Dishes from the Wild Horse Desert by Melissa Guerra. But I also love to read travel type cookbooks, so I’d love to win the Auberge of the Flowering Hearth! I just became a fan on FB. Does my mom’s recipe index count as my favorite recipe book? Otherwise i’d say i’m a fan of Pioneer Woman’s Cook book! Also, i subscribe to your blog! Hi, you are the cooking giveaway queen these days! My favorite cookbook is from a little know chef from Quebec, Canada called Jean-Francois Plante. He wrote his first cookbook with his favorite recipes which 3 have become our absolute favorites too: pork tenderloin w/nut & blue cheese sauce, mussels in curry sauce & soup w/palm hearts. I am already a fan on Facebook! Cheers! my favorite cookbook? Well TODAY it is David Tanis “A platter of figs and other recipes”. Love it. But tomorrow is another day….. I am a fan of yours on facebook and regularly share your articles. I subscribe to your feed, love your writing and yours is one of the first sites I pull from when looking for something to cook. For me it is anything by Ina Garten- I read her cookbooks from cover to cover! One favorite cookbook- gosh, that’s difficult. Here’s one I’ve worn out over the years “Pacific Flavors” by Hugh Carpenter and Teri Sanderson. Asian fusion cuisine with yummy recipes and beautiful pictures. A quick check at Amazon has it only in paperback, but I advise searching out a hard cover copy. BTW, congrats on your Ziplist/Camp Blogaway win. I just signed up yesterday, so I’ll see you there. More bacon! You’re killing me this week. If I could only own one cookbook it would be Bittman’s How to Cook Everything because it teaches techniques as much as recipes. I think it’s a must-have for new cooks. I love all of Ina Garten’s books, although I think the amount of fat in many of her recipes in unconscionable. I love Joy of Cooking, Silver Palate and Sarah Leah Chase’s Open House cookbooks because they remind me of my childhood. Joan Nathan’s Jewish Cooking in America and Claudia Rosen’s The Book of Jewish Food connect me to my heritage and are my go-tos for holiday time. Lately, I’ve been pouring over the Ball Complete Guide to Home Preserving . My favorite cookbook is “All About Braising” followed closely by “The Perfect Scoop”. If I was on a kitchen desert island I’d want those two with me! This sounds like a wonderful read. My favorite cookbook is The Lee Brothers Southern Cookbook. My favorite cookbook for cooking is Ellie Krieger’s The Food You Crave. Love the healthy eating with real food, not processed junk. For reading, I love all of Susan Branch’s books. The hand-drawn pictures and text combined with family stories and traditions make lovely books. my favorite cookbook is Alice Water’s Art of Simple Food with a close second by Heidi Swanson’s Super Natural Cooking. I got both in the first year I moved to California and they transformed my cooking style. The most-used cookbook in our house is one my IL’s church put out a few years ago. Its one of those conglomeration cookbooks where each member submits a few recipes and there are “words of wisdom” sprinkled throughout the book. Inevitably some of them are really bad (there’s one titled Hanky Panky. For real.) but others are family favorites (meatballs, ham balls, banana bread). Our family is great about trying new things, but we definitely love our Midwestern meat and potatoes kind of fare. I am loving the Bread Bakers Apprentice by Peter Reinhart. I’ve barely baking anything yet, but even just the simple cornbread was by far and away the best cornbread I’ve ever had. Hands down. I also follow your feed on Google Reader. Favorite cookbook? That’s tough. The New Best Recipe from Cooks Illustrated has gotten a ton of use, as has The Complete Cooking Light Cookbook. But the one that I’m using most often these days is Not Your Mother’s Slow Cooker Cookbook. This is the perfect weather for all those hearty soups and maple cinnamon oatmeal. Delicious! Cooking Down East by Marjorie Standish – Amazing, basic cookbook that my grandmother had been hunting down for me for years! I follow on my google feed! I don’t know. How can you pick a favorite? I love my Cook’s Illustrated Baking. And the 60 Minute Gourmet, and the Frugal Gourmet, and my Rice Bible, and now Julia Childs. There’s a cookbook in my basement waiting for you, btw. For when you have a bigger place and more bookshelves. One of those beautifully bound, red leather and gold things with ingredients and measurements so early last century it’s impossible to cook from. Never used a single recipe, but it’s a purty book, handed down to me by a family friend. I’m a fan. Favorite cookbook? Well, I love How to Cook Everything by Mark Bittman. One my husband favors and I don’t see mentinoed is Peter Berley’s Modern Vegetarian Kitchen. I think I read that your husband wanted to eat more vegetarian meals. If you don’t have Berley’s book you may want to check it out. My favorite cookbook shifts. Right now I love Moosewood New Classics. I subscribe via email. My favorite cookbook at the moment is Dorie Greenspan’s Baking from my HOuse to YOurs. I love it!!!!!!! Also, I am an RSS subscriber. My favorite cookbook is a notebook from my mom, recipes from my aunts and grandmothers handwritten, things cut out from magazines, annotated, things recopied from other cookbooks that appealed to her. A little brown leather binder, everytime I pick it up, half a dozen things fall out. I follow you on your blog and on Facebook. I really appreciate what you do! A current fave cookbook is Falling Cloudberries–delightful title for a book packed full of wonderful recipes. I follow your blog, FB, and Twitter. My favourite cookbook is The Complete Harrowsmith Cookbook. Just tweeted. this is such a fun giveaway! My favorite cookbook remains Marcella Hazan’s Classic Italian cooking. I am now subscribed to your RSS feed and I added your site to my readling list! ps I found you from a RT by SomethingExtra and love your recipe here and for irish soda bread, which I am making right NOW! Love your twitter photo background and I used to live in Los Angeles, small world! Right now I’m loving The Flexitarian Table by Peter Berley. I’ve been struggling to cook meals that satisfy both my vegetarian needs and my husband’s meateating ways and this book has given me a bunch of ideas to make both of us happy! Favorite cookbook: currently, am IN LOVE with Jeanne Kelley’s Blue Eggs and Yellow Tomatoes. It is brilliant, and everything I’ve made from it (maybe half the book, at this point — and note that I’ve only had it for…3 months?) has been *excellent*. And I’m an RSS subscriber! And I just tweeted about how much I want to win — love your blog, Kate, love Alice Waters, so I know I’ll love this cookbook! My favorite cookbook–maybe not to work from, but in my heart–is the Pennsylvania Dutch Cook Book Book by George Frederick.